Identical twin sisters born with a rare, life-threatening condition twin-to-twin syndrome (TTTS), have made a remarkable recovery. Their mother Natalie Smith, 42, underwent an emergency caesarean section a month early on February 9, to boost their chances of survival. 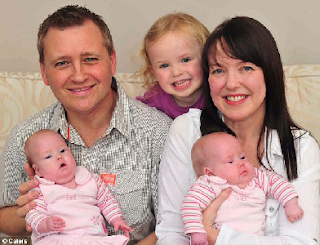 They were born at the Royal Gwent and Nevill Hall hospitals in South Wales with Bessie weighing 3lb 1oz and Hattie weighing 2lb 12 oz. While pregnant, Mrs Smith said she had a ‘mother’s instinct’ that something wasn’t right because of reduced movement, which was confirmed in a scan.